It may not feel like but Spring is just around the corner. And we are so ready for it! This has been a long, hard winter so we can't wait for the sun to start warming the earth and the daffodils to flower. 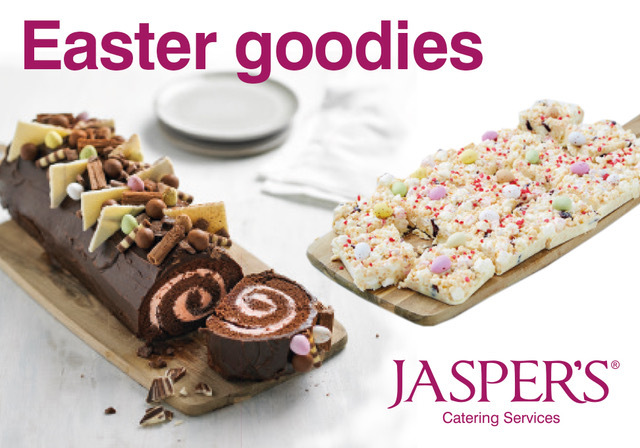 Jasper's has introduced a range of cheerful cakes to mark the new season, including a bright and beautiful Daffodils and Daisies Lemon Loaf cake and egg-quisite blue-iced, triple layered Duck Egg Rainbow Cake. They make for a stunning treat for staff or guests; centrepiece for afternoon tea or heavenly seasonal dessert. We also have an array of Easter delights to order, many of which are chocolately! Large cakes such as the Happy Easter Lemon Cake, a decorated Chocolate Roulade, Mini Egg Muffins and Rocky Road white chocolate traybake. The full range is available to view here. Why not do something egg-straordinary and order some of these treats for your workplace? Available online now or by contacting your local Jasper's.